So you’re interested in a new Tesla Model S, or maybe even the Model X SUV. You’ve probably already heard and read all the performance details: 0-60, 1/4-mile, and even top speed. But, have you considered the Tesla top speed for charging? Huh?! There is no gas-tank on a Tesla and it requires electricity for charging the 7,000+ lithium-ion cells. Hidden in the depths of the website are the fine details like: for charging, the Tesla top speed is only 52 MPH. Each hour charging, it’s adding a 52-mile range to the TESLA battery. Keep in mind, reaching this 52 MPH charging rate requires the best Tesla charger they have to offer. Not only that, the charger needs to be supplied with 240-volts and backed by a 100-Amp breaker. Who has an addition 100-Amps of power left in their breaker panel? Not many! Now we get into a whole different arena, discussing power available to your home, usage, price per Kilowatt hour (kWh), etc. Tesla Electric Semi – Should Diesel Mechanics Care? Experience driving your Tesla – Priceless! Let’s get realistic. You just dropped $80K on a new Tesla (figuratively speaking), the last thing you want to do is dump another $4k in home electrical upgrades. Think I’m wrong, check with your local electrician on upgrading your electrical panel to 350 or 400 amps. In addition, this includes the hassle of pulling permits and dealing with the power outage. You may even require upgrading the actual electric service line running to your home. The Tesla wall connector costs $500 and the same unit can be adjusted for use with 120V or 240V, from 15A all the way to 100A. Instructions on the Tesla site make this a pretty simple task. So, let’s assume you have 50 Amps available in your electrical panel. 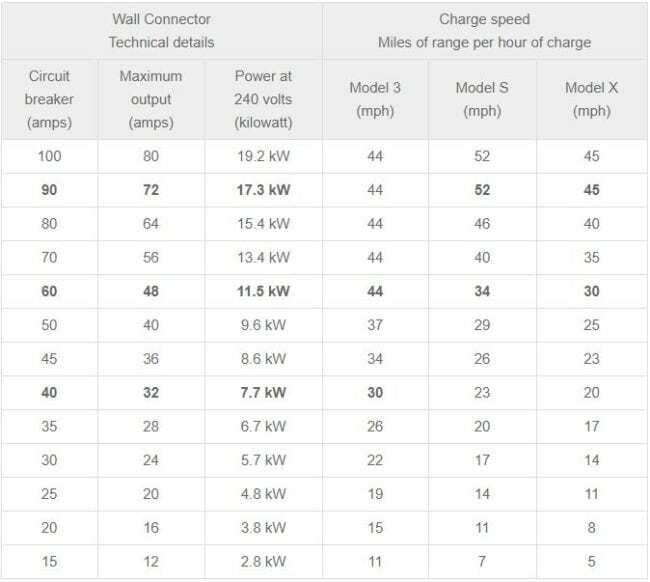 The 50A breaker will have a 40A max output, which will charge the Model S at a rate of 29 miles (range) per hour. The Model X is slightly lower at 25 miles, while the Model 3 achieves 37 miles per hour. This charge rate is roughly 9.6 kW per hour. The average cost in the US for a kWh is about $0.26, equating to about $2.50 per hour charging. What type of charger is included with a Tesla? The Mobile Connector charger comes with every Tesla sold, which plugs into the typical 120V – 15A outlet. This charger unleashes a whopping charging top speed of 3 miles per hour. The average North American only drives 37 miles per day. However, even charging at 10 hours each night, this will only provide a 30-mile range. 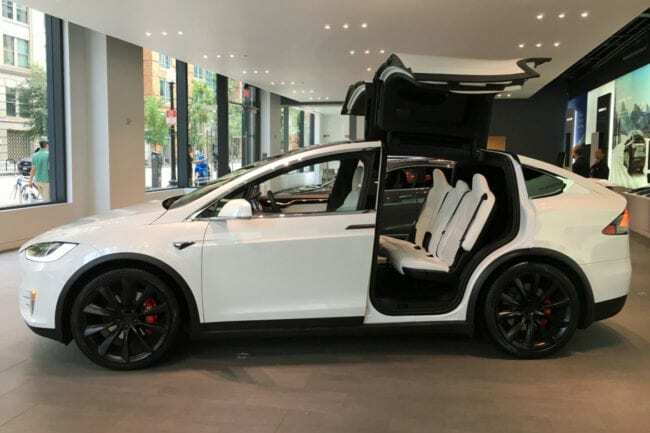 If you have the Model X, that’s down to a 20-mile range (2 miles per hour). Installing a Tesla Supercharger at your home is not an option. These chargers output 145 kW, which is considerably more than any home electric service will provide. The Supercharger stations will charge a Model S/X to about 80% in just 30 minutes. This 1/2-hour quick charge is enough to power most commutes. There are now more than 1,000 Tesla Supercharger locations across the USA. You’ll find many of these stations in front of popular malls and shopping areas. Many seem to think that the Tesla Superchargers are free for Tesla owners – not so. Each Tesla S/X owner receives 400 kWh of free Supercharger credits, hence enough to drive about 1,000 miles. Rates for charging thereafter depends on the local electric utility rates. Oregon rates have risen from $0.12/kWh to more than $0.24 (doubled), and California went from $0.20 to $0.26/kWh. No doubt, Tesla is the leader in electric car technology. They add class and performance to their all-electric sedans and soon-to-launch roadster. While these cars carry a hefty price tag, you can’t assume the costs stop here. Even the normal commuter can’t keep the Lithium-ion battery charged with the 120V mobile connector (home charger). So, plan to shell out a few grand to cover the upgrade to your electrical panel. Maybe it’s time to invest in a Tesla Solar grid for your home as well. Tesla Top Speed 52 mph? More like, Tesla Average Speed 29 mph. Editor’s note: this article originally published on September 25, 2018. No hating EVs here. I’m sorry if it came across that way. I think the Tesla is a great vehicle, S, X, 3, or roadster. This article is just pointing out the requirements for charging at home, and the rates at which they charge. EVs are very efficient, but they’re not free to charge. If any of my data is wrong, then please let me know. You’re right, the Leaf is not the most eye-catching vehicle, but it’s serving the purpose you intended. Job well done. The majority of Tesla’s on the road today do have free supercharging, it’s only recently they changed that.